Tsakhurs (call themselves yikhbi ) � are an indigenous peoples of the Caucasus (Dagestan and Northern Azerbaijan). Nowadays officially, there are about more than 30 thousand speakers of Tsakhurs live in Rutul region of Dagestan and Zakatala, Kakh and Belokan regions of Azerbaijan. They have lived in the most geographically remote valleys in the mountains, headwaters of the river Samur (valley of Gorniy Mahal) in Southern Dagestan. Administratively the Tsakhur villages in Dagestan belong to the Rutul district and the three bordering Azerbaijani districts: Zakatala, Kakh and Belokan. There are 13 Tsakhur villages in Dagestan: Lek (Kurdul), Gelmets, Mikik, Khiyak, Tsakhur, Suqut, Muslakh, Mishlesh, Korsh, Jinikh, Attal, Bash-Kalal, Bash-Muxax. And 16 villages in Azerbaijan: Mamrukh(Mamrux), Suvagil, Agdamkelal, Ali-Bayramly, Alasgar, Gezbarakh, Kas, Karkay, Mukhakh(Muxax), Sabynchy, Kalal, Meshlesh(Cincar), Qum, Lyekit- Kotuklu, Chinar, Uzumlu. The significant number tsakhurs live the cities of Zakatala and Kakh. Aside from these, tsakhurs also live in settlements Zakatala, Kakh and Belokan shared with other peoples: Chobankol, Qimir, Lahic, Katekh, Chardaxlar (avars- tsakhurs), Zarna (azeri(azerbaijanis)- tsakhurs), Gulluk (azeri- tsakhurs), Tala(avars- tsakhurs- azeri),Cimcimax (tsakhurs- azeri),etc., and also in cities Baku, Ganja , Sumgait, Mingecheur and cities of Russian Federation. Their neighbours to the east are Rutuls, North - Laks and Archis, Northwes and West - Avars, South - Azerbaijanis and Georgians. Tsakhur language (Ts'akhbishda miz) belongs to the Lezgian group of the North-Eastern Caucasian languages. The majority of Tsakhurs know several languages besides their own language including Russian and Azerbaijani. Since 1994 Tsakhur has been taught in primary school as a subject. In the 1930�s the first Tsahkur alphabet was introduced a Latin script by Genko A. However, this script was not used in extensive shape. Again, the language became written in the 1990s in the Cyrillic script. Tsakhur is a split ergative language. Transitive subjects are marked with the ergative case; intransitive subjects and direct objects receive nominative (or, in a different terminology, absolutive) case marking. First and second person pronouns morphologically do not distinguish between ergative and absolutive cases. Tsakhur is a mainly agglutinating language. Its morphology is basically suffixing, though infixing is not rare. Like all Daghestanian languages, Tsakhur has a rich paradigm of nominal cases � there are eighteen. The verb has two basic forms � the perfective form and the imperfective form. These are aspectual forms; temporal meanings are expressed periphrastically, by one of these forms and a copula (or an auxiliary). According to G.H. Ibragimov (�The Tsakhur language� 1990), the language has two main dialects: the Tsakh dialect and the Gel�mets dialect. Tsakhur literacy is based on the Tsakh dialect. Since 1995 the Tsakhur newspaper �Nur� (�The Light�) has been published. Since April of 2002, the Tsakhur language radio has been broadcasted in Dagestan. The Tsakhurs are Muslims (Sunnites). In history Tsakhurs had many famous devouts (called them Efendy).In the 13th century, the city of Tsakhur was one of the main centers of Islam in southern Dagestan. 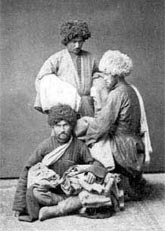 The earliest written records date back to the sources of ancient Georgia and Armenia where Tsakhurs are called Tsakhaiks. There are notes about the Tsakhur Khanate, also commendations on their culture, their mighty buildings and fortresses. Until the 19th century, Tsakhurs had to fight a succession of fierce and bloody battles to maintain their freedom. Frequently, the encounters were with neighbours, but there were also engagements with more distant enemies: the Arabs (7th century), Tamerlane's army (1396), the Shahs of Shirvan (12th--14th centuries), Transcaucasian rulers (15th--16th centuries) and Turkish and Persian sultans (17th--18th centuries). By the 15th century a khan (later a sultan) had become head of the Tsakhur communities. Until the 17th century the Khan's residence was Tsakhur. Later it was transferred to Elisu in Transcaucasia and from then on, Turkish and Persian sources call it the Elisu Sultanate. In 1803 the Tsakhurs became subjects of the Russian Empire, but the sultanate was allowed to maintain its own internal politics.The dependence of the Tsakhurs on the Sultan of Elisu increased during the reign of Daniel-bek in the 1830/40s when, with the assistance of tsarist troops, he succeeded in subordinating most of the Tsakhur communities in region. As large numbers of ethnic Russian settlers started pouring into Dagestan already from around 1800-1810, the Tsakhurs and other indigenous groups resisted. The Russian influx triggered the Shamil rebellion in 1834. When the Shamil Revolt reached the Tsakhurs in in 1844, Sultan Daniel-Bek supported the rebels against the Russians. As a result, in 1852, by the order of the Russian commander-in-chief, was dissolved the Elisu Sultanate. The Soviet regime reached the Tsakhurs in the spring of 1920 and brought about numerous changes within the Tsakhur community - the Tsakhurs divided by two different parts of an empire (Azerbaijan SSR and Dagestan SSR), many of which only became evident after World War II, with the consolidation of collectivization. In 1991, again Tsakhurs divided by two entirely new countries -- the independent Azerbaijan Republic and Russia Federation. The Tsakhur traditionally wove textiles from wool combined with silk threads. Other traditional crafts included the making of rugs, the knitting of woollen socks and footwear, and working in wood, leather and metal.